Horror games have the run the gamut from the tense and tight affair of the original Dead Space to the side-scrolling scares of Little Nightmares. While they all differ in their methods, rarely do we see a unique approach applied to the genre. In this case, one that dims the lights and leaves you in relative darkness. While Perception certainly doesn’t reach the heights of the two games mentioned, there’s still some fun to be had as you mosey without sight through the hallways and bedrooms of a haunted house. As Cassie, a young girl afflicted with blindness who looks like Cortana from the Halo games, the player visits a typical New England home after seeing visions in a dream. 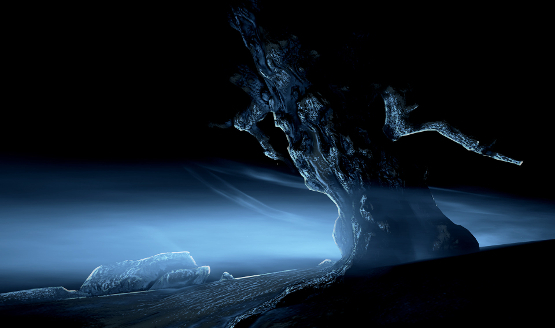 Straight away, Perception throws you into the middle of a moving plot. While that works effectively if done right, I was instead left confused and feeling as though I had to do a lot of mental work to connect the story threads together. While the game does include some flashback sequences that show you the life of Cassie before her trip to Massachusetts, it’s introduced in equally confusing ways and occurs at seemingly random points. The developers were able to create a sense of empathy towards the character from the get-go, but that’s all squandered by a confusing narrative that never sets the player up to understand exactly what’s going on. And the amount of dialogue certainly doesn’t help. The games give you the option to choose a Silent Night mode that only delivers dialogue at key points in the story. I should have seen that as a warning sign, but instead I scoffed at the idea and chose the recommended setting where Cassie narrates the adventure as you move through the house and find answers. Unfortunately, I should have taken the hint. While the main character’s dialogue is sharp, something that can’t be said for the supporting cast, there’s just too much talking. And that’s not the only issue. The game delivers some authentic scares, but the main character doesn’t seem fazed at all. As I jump backed into my seat or embarrassingly hurled my headset away, Cassie just pretends like nothing happened. That creates a huge disconnect and destroys immersion when the main character isn’t reacting as the player is. This is made worse by the sheer amount of notes and audio logs the player is forced to interact with. Not only is the voice acting average at best, but you’re forced to stand there looking at a tape recorder instead of continuing to play the game while the audio is still present in the background. One room features a broken TV and about three meters of movement space that I was given the luxurious opportunity to explore while waiting for a minute or two for an audio log to end. Simple design decisions go a long way to creating an enjoyable experience, and Perception is filled with mistakes of that kind. While the actual mechanics are executed in a similar way to the narrative, they do offer up moments of creativity as the blind and dark approach hasn’t been used much in the genre. I can only compare it to 2015’s White Night that featured a similar system in a similar setting – although that game did it better. Perception’s take on the mechanic has Cassie using echolocation to outline the objects in an environment via the movement of her steps and the whack of her cane. Players have a few seconds to analyze the reveal of the surroundings before moving towards the objective. The developers make sure the player doesn’t always just whack their cane on every table and chair in the house by introducing a threat that lurks in the dark. The genuinely terrifying Presence figure, a demon in the dark, tracks the amount of times the player makes noise and acts as a foil to prevent the player from mashing the R2 trigger to reveal the contents of the mansion at every opportunity. But there’s a twist. The house changes its layout every so often, forcing the player to think on their toes and strategically use the cane at certain points. Closed off paths, locked doors, and obstacles blocking an entrance make for some puzzle solving segments, although that’s all there is in that department. Most of the mission design is centered on finding objects and making it to certain locations, and that isn’t helped by a Sixth Sense system that directly highlights the next objective the player should head to. It shuts down any sense of challenge and quickly turns a horror game into a ‘follow the marker’ interactive walking simulator. While that is somewhat enjoyable near the beginning of the game, as you’re introduced to some of the stunning outdoor locations wherein harsh winds light up the environments in hues of blue and white, it becomes a drag rather quickly as the mysterious plot also isn’t all that inspiring. There’s just not enough fun to be had in Perception in its simplistic horror and, in a year where gamers have already gotten a few stellar titles in the genre, it’s going to be left behind. Perception is a game of wasted opportunities and poor execution. It presents a unique mechanic only for it turn stale as it lingers without any evolution, it introduces a character that the player has empathy for only to make her unrealistic and unlikable, and its inconsistent design decisions turn a promising adventure into a frustrating one. Almost all of Perception’s issues could be fixed with slight tweaks to the game’s systems and narrative moments. Instead, it’s a false mirage of an excellent game that vanishes almost immediately, turning into more of what we’ve already seen in the horror genre. Review code for Perception provided by publisher. Reviewed on PS4. For more information on scoring, please read our Review Policy here.